Dust storms on Mars will come as no surprise to those who watched or read of Mark Watney getting stranded on Mars in ‘The Martian’. While in the movie the dust storm was a smaller localised event, the dust storms on Mars can truly become massive, even to the point when they engulf the entire planet as shown in the image above. These global dust storms occur on average once every 5 and a half earth years while regional ones are more common, especially during the Martian spring and summer. Why are these dust storms of interest? The dust storm above was photographed on the 18th November 2012 by the Mars Reconnaissance Orbiter in the southern hemisphere of Mars. Temperature changes of 45 degrees Fahrenheit (25 degrees Celsius) were detected 16 miles above the storm due to dust absorbing sunlight at this level. 1 Both rovers on Mars (Opportunity and Curiosity) detected atmospheric changes but their solar panels were not affected. This very issue with the mars rovers is one of the reasons why it is so important to understand Martian dust storms. These rovers rely on solar power generated from their solar panels and dust in the atmosphere and gathering on the panels disrupts this. Any missions to Mars will rely on solar power and as manned missions to Mars are being pushed for, being able to predict when and how big dust storms will get will be extremely useful in mission planning. When do dust storms normally happen on Mars? Mars takes 2 earth years to orbit the sun which is 668 sols (duration of a solar day on Mars) and during this time it goes through seasons. 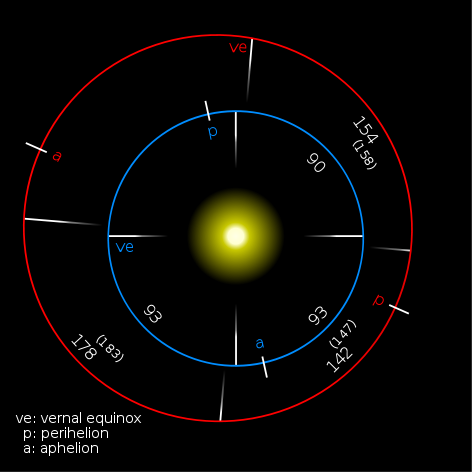 On earth our seasons are the same length of time because our orbit is nearly circular with the earth moving at a constant speed, however, Mars has an elliptical orbit which takes it much further away from the sun at different points in its orbit with its speed slowing. Mars reaches a distance of roughly 249 million km at its furtherest distance from the sun (aphelion) and comes to roughly 207 million km at its closest to the sun (perihelion). Mars travels at its slowest at its aphelion and fastest at its perihelion meaning that in the southern hemisphere the summers are warm and fast with the winters long and cold. Just as on earth we have monsoon season or rainy seasons, Mars has a dust storm season just after the perihelion which is during the southern hemisphere’s summer. So when looking for dust storms keep a close eye on the southern hemisphere during this time. Can I see dust storms through a telescope? Absolutely. The dust storms on Mars are one of the events that amateur astronomers on earth can actually observe and track with their telescopes. Dust storms on Mars were first observed in 1809 when Honore Flaugergues observed yellow clouds and since then we have been monitoring these climate changes. Nowadays, digital imaging or visual observing make it possible to track regional dust storms that are within the grasp of smaller amateur telescopes. I have personally imaged them with a 9.25″ aperture telescope. Smaller telescopes may not be able to resolve them and it is always worth contacting your local astronomy club to get advice and have a look through some of the telescope there before purchasing one. Happy Hunting! NASA. 21 Nov 2011. Spacecraft monitoring Martian Dust Storm. Guy Webster / D.C. Agle 818-354-5011 Jet Propulsion Laboratory, Pasadena, Calif. The planetary Society. Mars Calendar. New Shepard In-Flight Escape a Success!